In 2019 wellness is for everyone. Gone are the days of fast fitness and fad diets as the new year has ushered in a cultural focus on total mental, physical and emotional health. With this new shift comes changing expectations from the consumer on their workout experience. Everyone is looking to join a fitness movement that caters to them, providing a community of support on their journey as well as personal relationships with coaches and other aspiring athletes. This personal community aspect leads many individuals to gravitate towards boutique fitness chains over the traditional style gyms. However, with a few adjustments to create a more personal member experience, gyms will be able to compete with custom fitness chains and help their members thrive in mind, body, and soul. Health isn’t just about physical fitness anymore, but also about nutritional wellness. Increasing consumer knowledge of the importance of fueling your body for peak performance leaves many exploring the likes of Whole30 and Paleo eating habits among others. While individual research can be productive, having the counsel of a nutritionist turns healthy eating into a lifestyle. Gyms can easily offer this service to current members by partitioning off a segment of their floor space in the weight or cardio area with a portable room divider to set up a makeshift office for the nutritionist. The nutritionist can then consult members in a private, quiet space that is still easily accessible. If this service is only offered at certain dates or times, the dividers can be collapsed and stored neatly against the gym space walls without impacting other members. Offering even just this simple service is a way to create personal connections with members and service them beyond their workout alone. One of the elements missing in traditional gyms is a sense of community. With hundreds of members, it can be extremely difficult to connect members of similar interests and goals and support them in an individualized way. 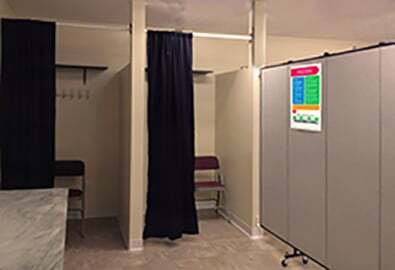 Creating a member bulletin board on a portable room divider can help foster that community and display additional resources. The gym can add pictures and bios of trainers, suggested workout plans, featured members and a hanging dry-erase calendar with important dates and events. Members can add shout outs to other members, events or organization advertisements and even ask questions or provide feedback to the gym. Creating the bulletin on the portable room divider allows gym owners to move the announcement around the gym at any time. Some great locations could be in front of the locker rooms, at the entrance to the gym or near a stretching or rest area. Stretching after any athletic activity is equally as important as the activity itself. 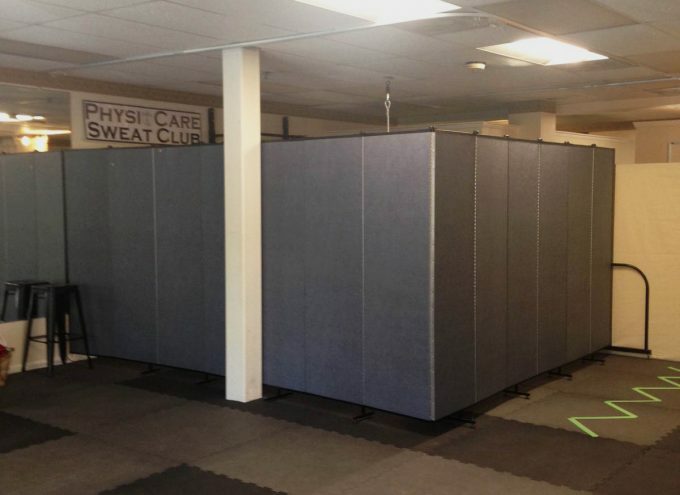 While many gyms have an open stretching area, it usually also serves as a weightless fitness area and provides little to no privacy from the rest of the gym. Segmenting off this area with a portable room divider offers members more privacy, quiet and a restful atmosphere for cooldown. Special stretching services could also be offered in this area like muscle rolling and assisted stretching. Recommended stretches for different types of activities could be posted on the interior walls of the area to guide members in reducing muscle soreness and injury. Creating a member-focused experience is essential to retaining members and competing with other fitness organizations. Keeping custom member needs in mind and fostering a sense of community are key differentiators that will help transform the gym experience and ultimately the health and lifestyle of others. A flexible gym space not only lets you expand your services but increases revenue. A win-win for everyone!